from 1 OCT till 31 MAR see "Additional information." Avoid overflying of Olomouc town below altitude 2000 ft/600 m. When approaching RWY 27 or RWY 28 the base and the final turn maximally on a level with Okružní street (the most western street of the town, crossing the RWY 27/09 centreline). Take-offs from RWY 27 or RWY 28 only, take-offs from RWY 09 and RWY 10 in an exceptional case only. Touch and go landing on RWY 09R, 09L and 10 is prohibited. Do not overfly village Topolany after take off from RWY 27 or RWY 28. Powered aircraft after LDG on RWY 09 or RWY 10 go on a level with TWY A turn left to leave the RWY and continue along a paved TWY A to the stand. Powered aircraft after landing on RWY 28 backtrack along RWY 28 and continue along TWY A to the stand. 1.1The provision of snow clearance on runways is limited. Actual information is provided by Providing information to known traffic in AD operational hours. 1.2The traffic circuit altitude is 1800 ft/550 m AMSL. 1.3.1Avoid overflying of Olomouc town below altitude 2000 ft/600 m. When approaching RWY 27 or RWY 28 the base and the final turn maximally on a level with Okružní street (the most western street of the town, crossing the RWY 27/09 centreline). Take-offs from RWY 27 or RWY 28 only, take-offs from RWY 09 and RWY 10 in an exceptional case only. Touch and go landing on RWY 09R, 09L and 10 is prohibited. 1.3.2Do not overfly village Topolany after take off from RWY 27 or RWY 28. 1.3.3The stand no. 3 is intended for performing power engine tests during aircraft repairs. 1.5Arrival of aircraft without two-way radio communication is carried out along the track Hněvotín - TWR at the altitude 1400 ft AMSL. 1.6Powered aircraft after LDG on RWY 09 or RWY 10 go on a level with TWY A turn left to leave the RWY and continue along a paved TWY A to the stand. Powered aircraft after landing on RWY 28 backtrack along RWY 28 and continue along TWY A to the stand. The intermediate holding point W1 is established on TWY W. If an aircraft is cleared to taxi to the mentioned holding point it shall stop there. Further taxiing shall be cleared by unit Providing information to known traffic. 1.8The road Olomouc - Mohelnice in the vicinity of THR RWY 09 shall be overflown during take-off and landing in the minimum height 15 m from the lowest part of the aircraft or the towed object. 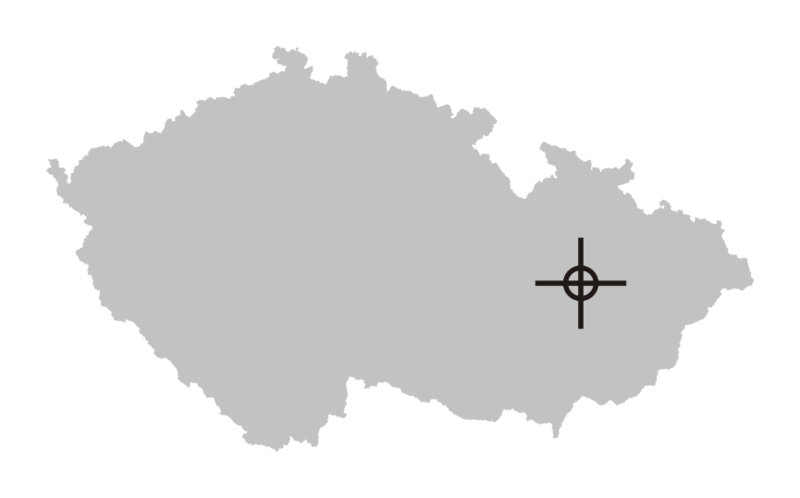 2.1Unit Providing information to known traffic provides information about the utilization of LKTSA24 by military force and information about Helicopter Emergency Medical Service in Olomouc. 2.2Providing information to known traffic in English language O/R 24 HR in advance. 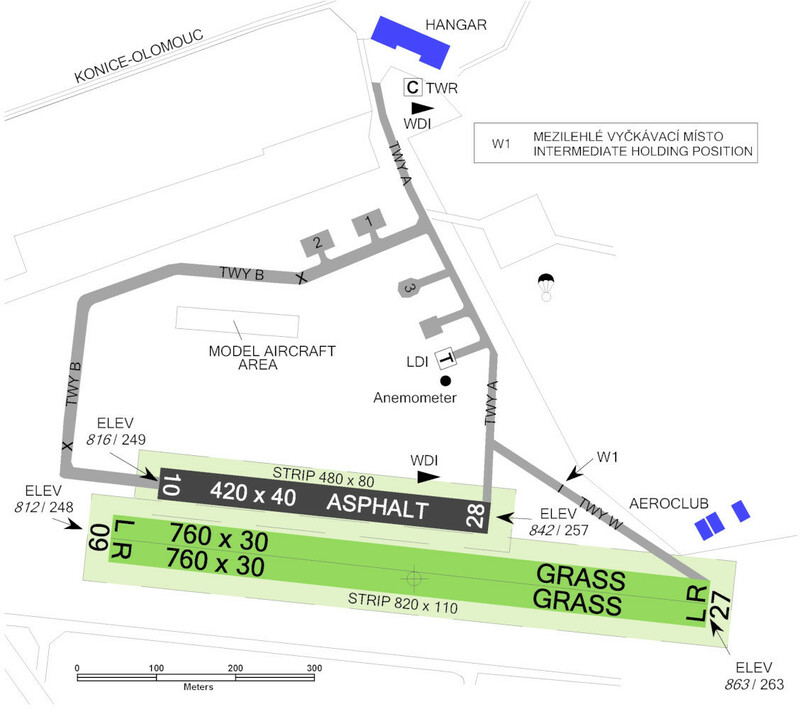 2.3Administration of aerodrome is provided by Olomouc Aerodrome Association z.s. Contacts are indentical to the contacts on page VFR-AD-LKOL-ADC. 2.5Non-cash payments for AVGAS 100 LL are accepted. All mentioned rates are without value added tax.